Found this interesting…and 3000+ downloads, so sharing it. 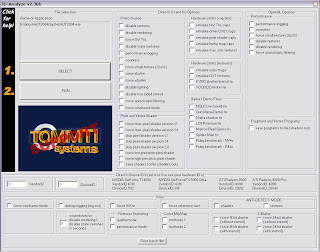 3d analyze is a Graphics Card Emulator that can emulate all the feature of a 3d graphics card like pixelshader 1.1, 1.4, 2.0, bump maps and a lota stuff. If a game stops running on your system just because u dont have a graphics card, dont worry 3d analyze will do it for ya. run 3danalyze select the game exe, select a few options u wanna emulate and there u go the game run perfectly now. like POP1, POP2, THE HULK, MX vs ATV are few to mention though. the list goes on if i start writing all of them here. The most basic option selection i used is as in attached screenshot… changed a bit here and there for few games…. SO JUST DOWNLOAD THIS SOFTWARE AND PLAY GAMES WITH IT….